Don and I left Laguna Beach by 7 am yesterday, so he could drop me off in Oceanside to continue by ride. I was back on the saddle before 8 am, with temperatures heating up fast. 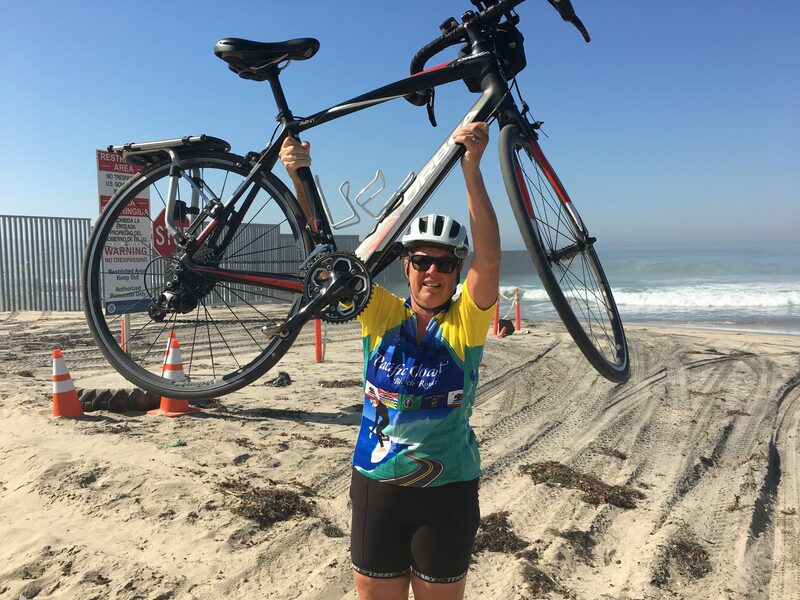 The route was basically along the coast, from one oceanside community to the next, some more prosperous than others, some with designated bike lanes, others with just the shoulder: Carlsbad, Leucadia, Encinitas, Cardiff by the Sea, Solana Beach, Del Mar, Torrey Pines, La Jolla. The first few miles were on Carlsbad Blvd., which then joined Historic Highway 101. The hills near Del Mar and Torrey Pines were steep, and in the sun. I reached Torrey Pines Golf Course around 11 am; Don had put himself on a wait list for a tee time and teed off around 11:20 am. I filled my water bottles and moved on. The route through La Jolla was a bit time-consuming and I did stop briefly at the Cove to see the seals. By 12:30 pm, I was along Mission Bay and hungry. I connected with a Radford friend, Sally Hornisher Cain, in Point Loma – not a fancy restaurant but we were able to catch up on mutual friends. I followed Mission Blvd past the San Diego Airport and arrived in time to take the 4 pm ferry to Coronado – needless to say I was not moving fast. After a quick stop at Walgreen’s for a phone charger (almost out of power), I headed along the Silver Strand to Imperial Beach, with wild hopes of making it to the border park before sunset at 6:05 pm. The wind was not in my favor, I was hot and tired. And it was quite a distance (15 miles?). Anyway, Oxy friend Larry Saben was meeting me at Border Field State Park to maybe take pictures and then drive me to his house. As I pulled up at 6 pm to the closed gate to the Park, my rear tire was flat – the first flat of the trip! We walked toward the beach as the sun set – and discovered it was well over a mile away. Plan B was quickly instituted, my bike went into his car, and the end of the journey would be another day…. So, this morning, Don and I drove 20 miles (40 minutes) to this remote park, he walked/I rode 1.6 miles to the beach to take the requisite photos, sadly observing the fences that separate us from our southern neighbors. The sun was still hot – and my Pacific Coast tour was complete: over 1800 miles from Canada to Mexico, no walking up hills, one day lost on the tour due to mechanical problems! It felt like quite an accomplishment for a 69 year-old grandmother!! Celebrating the end of my journey from Canada to Mexico! Congrats Dolly. As always you amaze me. We are so very proud of you! Congratulations on this fantastic achievement! We are thankful it was a success and that you are safe. Looking forward to seeing you soon! Dolly, you rock girl! Congratulations! Congratulations DOLLY. What a great memory. You sure set the bar high for the grannie set. Congratulations, Dolly!!!! A great accomplishment. Your last post brought back memories. We left the beach at Carlsbad for our coast to coast and on another ride rode on Coronado. Have enjoyed your posts and glad you had a safe trip. What an accomplishment! I can say I know someone who has biked from Canada to Mexico along the Pacific coast. That’s a feat your grandkids will be proud to brag on! Yea! Yea! Yea! Congratulations! What a great accomplishment. Fun to read your commentary on all the beach towns that I have visited over the years. Way to go, Dolly. Congrats! Very impressive Dolly!! Congratulations on accomplishing another goal!! Congratulations – such an accomplishment! I’ve been following your blog and it’s been so inspiring. Thanks for letting us share the adventure.